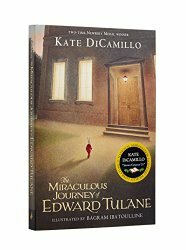 DADaPalooza: REVIEW: The Miraculous Journey of Edward Tulane- Fantastic! 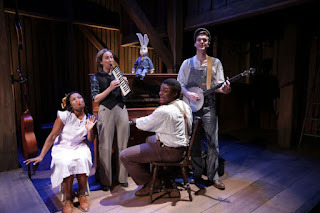 REVIEW: The Miraculous Journey of Edward Tulane- Fantastic! As I mentioned previously, we attended the opening night of the Chicago Children's Theatre opening night of the Miraculous Journey of Edward Tulane. It was fantastic! 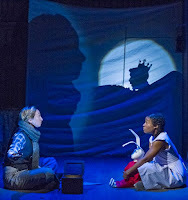 The acting, set design, puppet design, and directing all worked together perfectly to create a stunning evening of theatre. And, if you are a persistent reader of this blog, you know I don't say that often. The show is based on the best-selling kid's book, written by Newberry award winner Kate DiCamillo. 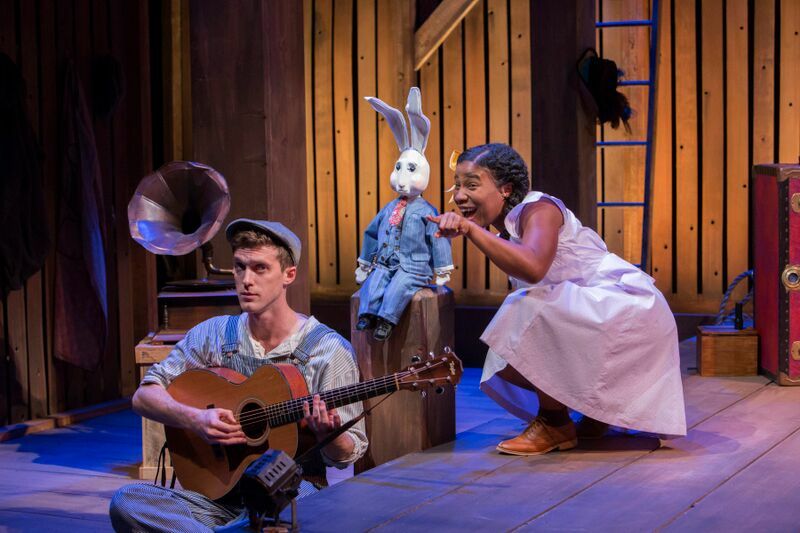 When I read the synopsis (about a dapper rabbit that gets lost at sea, goes through multiple owners, and finally finds himself) I was a little concerned that the storyline would be sacharine or sentimental. In the very capable hands of director Stuart Carden, all of the elements of the show move together into a non-sentimental and often very emotional (and at times very funny) show. The show moves along nicely, and while its story is itself easily graspable, the enacting of it is done masterfully. Enough can not be said about the 4 actors that portray all of the characters who Edward encounters. All of them play musical instruments. There's lots of puppetry, including shadow puppets. They move very well. They act with their whole bodies and their whole voices at the same time. They differentiate their many characters beautifully, using dialect primarily, and sheer acting chops. 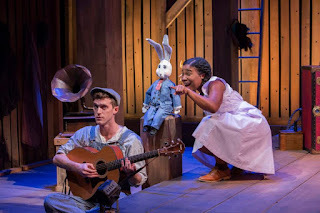 Special shout out to Patrick Budde, who plays the voice of Edward Tulane, starting out as a total narcissistic priss that ends up growing on you, and you end up cheering for him as he learns some very hard lessons. Also a shout out to Melanie Brezill, whose death scene was stunningly acted. But everybody was really great, and deserves mention. Jessie Fisher acted as the narrator and engaged the audience, drawing us in (and her evil-eye grandmother who gets disappointed in Edward) is hilarious. And Kelvin Roston Jr played the kind natured hobo so simply and well. I also want to call out to the props designer, who designed a lot of the puppets (but not Edward) Her quilted dog puppet, operated by a bunraku style puppeteer in full view of the audience, was a huge hit. The whole design staff and the director also did a great job. To find out more about the show, and to purchase tickets, visit the Chicago Children's Theatre event page. If you want to read the book, see the link to the right. The book also has a website: http://www.edwardtulane.com/. It has some great video excerpts talking with the author and the illustrator about the process of writing the book, as well as a great Teacher's guide to the book, which will be useful in talking to students about the show.